agghh... t'ain't nuthin' worse than going to work the next morning after a show!! anyways, a big thank you to all of you who came out to the show last night... taking a stand against the voice in the back of your heads that says, "are you crazy. its monday. you don't want to leave the confines of your home do you? really?" so a thank you to you and to len bias for opening up the evening. great band, len bias... its always fun to share sets with those guys... and by "always", yes i do refer to the two times we've played with them, including last night! but they do not disappoint! so yesterday evening marked a return after a several-month hiatus of sorts. granted, we've been busy working on new material and equipment and plans, plans, plans (as always) while were out, but it was good to be back playing (with a "streamlined" stage set-up (don't know if anyone caught that)), and with new drum-'flurian, hunter. mighty fine job he did last night. so, thank you again. hopefully, we'll see you all again on tuesday, october 9 at the rock n' roll hotel, when we will be sharing the bill with caribou and born ruffians. until then, take care and sleep easy. Make your little one a shining star! Shine on! While he was in town he waskind enough to make some of our equipment more pleasing to the eye. 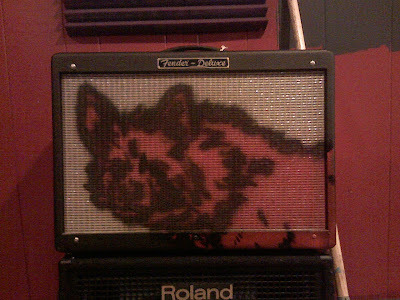 The first picture is a stencil he did on my guitar amp. 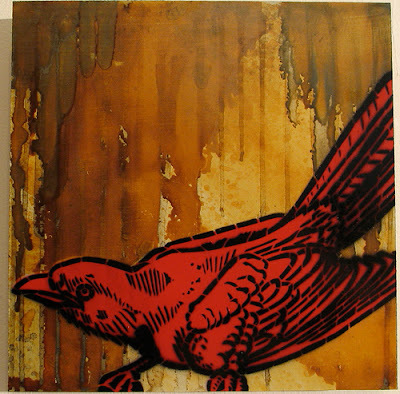 The second is one of his paintings which you can find at www.brokencrow.com. I would definitely suggest checking out his website and, if you can make it to the Maryland Art Place, to check out his pieces on display and those of the other artists in the exhibit.